Mentor-mentee relationship is a life-long journey. The theme of Mentorship Programme 2013 is 'Constellation'. Denoted as a meaningful stellar pattern formed by cluster of stars, Constellation symbolises our aspiration, which is to inspire participants through aligning successful leaders, business professionals and students from 9 local universities together. 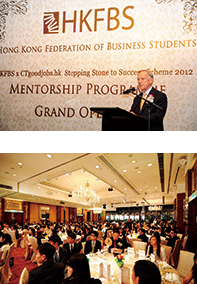 Mentorship Programme 2013 consists of two components, namely Grand Opening and Social Gatherings. We aim at enhancing participants' exposure, broadening their perspective and preparing them to tackle the challenge in the future. Over 100 business elites are invited from diverse fields to be our mentors, including Accounting, Banking and Finance, Consultancy, Government and Legal, Hotel, Human Resources, Information Technology, Insurance, Management, Marketing and Public Relations. “The S4 Mentorship Programme 2013 offers not only an invaluable opportunity for student leaders to sharpen their soft skills and learn from elites from an array of fields but also a gateway to the real business world, which is the asset you can never discover in books. Do cherish this chance to develop a better understanding of positions you are going to take in society in later years." Mentorship Programme 2013 consists of two components, namely Grand Opening and Social Gatherings. Social gatherings, initiated by our Executive Committee members, will be launched regularly starting from November.